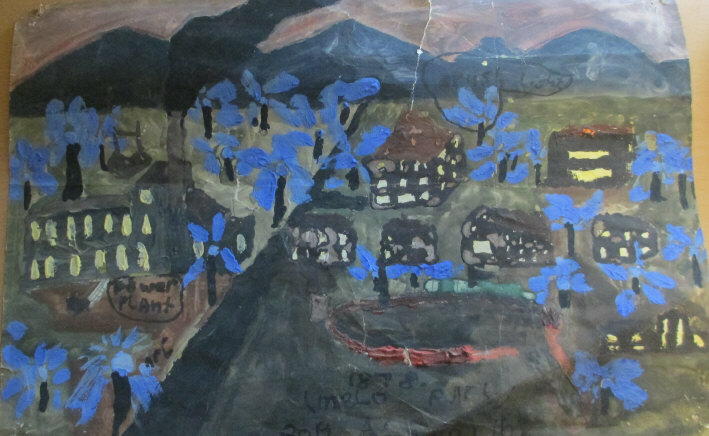 After a recent Diane Rehm show about a book called "The Age of Edison: Electric Light and the Invention of Modern America," I decided to dig out a picture I painted in a high school art class. Menlo Park, NJ. where Edison's labs were. It probably didn't look like this, but that was my impression. 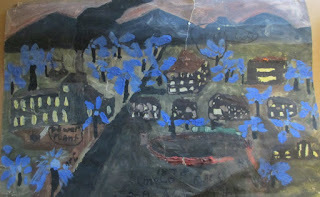 The art assignment was "brown and yellow tone in tempera paint." I threw in blue for an out of the box twist and the art teacher loved it. The blue was for arc lamps that worked on the spark gap principle. It was an 1800s style of electric streetlights. I added it to the warm yellow glow from inside the buildings from Edison's incandescent lamps. Around the time of painting this, I was reading the book "Men and Volts, the story of General Electric." The grade school I went to was Edison School. 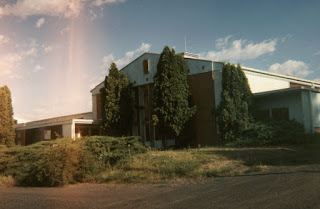 Edison School in Pullman, WA. where Thomas Edison was quite the role model. My childhood dream was to be an inventor when I grew up. Well, maybe writing unusual blog entries is good enough. Edison School was an innovative design in it's day when it was built in the late 1940s. By the time I came along in the mid 1960s, it's problems with rotting timbers was already evident. The school district was discussing tearing it down. I felt sorry for the old school. 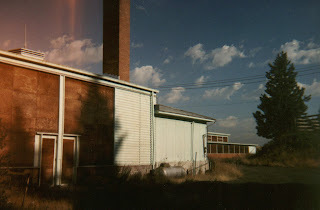 Some pictures I took of poor old Edison, in Pullman, during a bike tour around the state in summer of 1989. By then, it was abandoned. They finally got around to tearing it down in the 1990s after it stood empty for many years. Apartment buildings now stand where Edison was as Pullman doesn't need as many grade schools as it did back then. There seems to always be need for apartments, however. There is another Edison School close to where I live today. It's in the town of Edison, WA. just down the road from my home in Bellingham, WA. I've biked around Edison, Washington many a time; more recently. Long past those early days, I've heard quite a bit about Edison's rival Nikola Tesla. While Edison stuck dogmatically to using direct current. Tesla was working with the magical properties of alternating current. It must have seemed like magic, back in his day as one of the properties of alternating current is it's ability to "induce" electricity to flow in a coil that's not even physically connected to another coil where electricity is flowing. It's as if the energy just magically jumps across empty space between two unconnected coils. The work of an electromagnetic field. Well, that little piece of magic is taken for granted today and it's what allows transformers to work. It's also what's behind the "magic" of radio. In a world that was used to water flowing in pipes, the idea of inducing a current from one unconnected wire to another must have seemed revolutionary. Edison resisted, thinking that alternating current wouldn't be safe. Also, Edison was building his empire on direct current. It was his business model. Eventually, alternating current won out. It won out for many reasons including it's ability to make transformers work. Transformers step the voltage up or down depending on need. This allows the high voltage transmission of power over long distances. High voltage power is then "stepped down" with transformers to lower voltage power which can be safely used in buildings. DC current isn't as easy to step up or down, voltage wise, so it forces people to choose one voltage. It forces a compromise that's either too low to be sent long distances or too high to be safe in the home. Transformers solved that problem and eventually Tesla's style of electricity won out, for the most part. These days, there is somewhat of a cult following of Tesla. People think he may have had some magic that today's capitalists want to hide. Sending free power through the air in lieu of power lines, or something. I'm not sure how practical it would be to send large amounts of power through the air for long distances. Radio works over long distances with tiny amounts of power. Transformers work over short distances with large amounts of power. It is possible to send power via microwave and there are proposals to build solar power satellites in space which would send power back to Earth in a beam of microwaves. So far, the solar satellite idea hasn't been implemented, but it may have it's downsides. Imagine how much fear people would have about high powered microwaves zapping through the air from various installations. People are even paranoid about cell phone towers. So the magic of Tesla and, for that matter Edison, is already around us today. Things that may have seemed magical in the past, like electrical induction, are common place today. I'm sure more innovations are being thought up now, tho, as always, new innovations often meet resistance from the status quo.